Virginia Hoffman - What's Wrong With This Picture? Little did the unsuspecting mom know when she brought this cute puppy into her family that the battle for supremacy of TT over child would last the entire lifetime of the dog. As her son grew and her TT matured the dislike between the two never diminished. Small children and Tibetan Terriers can be a volatile mix. The TT's strong sense of self and intensity of mouthy play with sharp needle-like puppy teeth will send a small child screaming, thus solidifying in the pup's mind his rank over the child. Little children prefer to sit on the floor rather than the furniture and some would say the TT prefers the furniture to the floor! Whether you allow your dog on the furniture is not the issue. A child on the floor is. When on the floor what little stature a child has is diminished completely from the dog's point of view and a TT will see the child as another pup. It is a dog's nature to determine and acquire rank in a social group and this can cause serious difficulties for a family with children under 7 years (the age when a child will appear more like a person with authority). Extreme management is required at all times. When the kids are on the floor or running and playing the TT pup must be out of the picture, contained by gate, crate or leash and all interactions between dog and children must be carefully supervised. 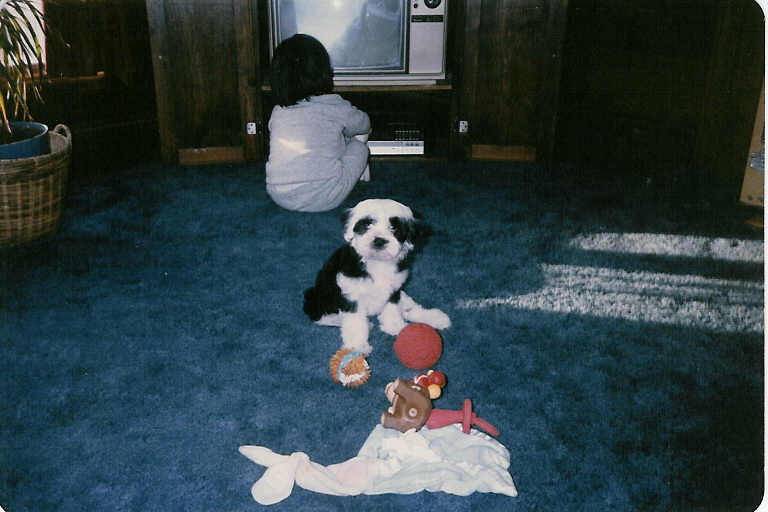 The amount of management and training involved to help small children and the Tibetan Terrier cohabitate peaceably is more than is viable for most families. Given the high intelligence, problem-solving skills and independent nature of most TTs it is more like adding another toddler to your home than a dog. Though all dogs, regardless of breed, should be well managed and supervised with children, some breeds view small children more as competitors than pals. The Tibetan Terrier is one of those breeds. It is advisable to wait until the youngest child is 7 years old before adding a TT to your family. Even at this age it can be a challenge but by 7 yrs. most children can be taught how to appropriately play and give direction to a new TT. Including a dog in your family should be a joy not a trauma, most especially for the children. Choosing a breed that is compatible with the ages and personalities of your children is the most important decision you will make. The next will be choosing the individual puppy who, when they meet, falls madly in love with your kids. Choose wisely and it will be a lifetime love affair for all of you. Virginia Hoffmann is a certified pet dog trainer and member of the Association of Pet Dog Trainers. She does private in-home behavior and training consultations in New York City and the Tri-state area for all breeds of dogs. She has worked with over 100 Tibetan Terriers and their families.